This web site will explain the entire salesperson process within 5 minutes. Many people only understand a piece of the salesperson puzzle. Here goes. To enter the field of Real Estate, you must begin as a Real Estate Salesperson, known as a Licensed Real Estate Salesperson in NY State. You must start as a salesperson, and only after years of experience, you will be eligible to become a Real Estate Broker, and not a second earlier. The course you must take is a 75 hour course followed by a closed book final exam. You must achieve 70% or greater to receive credit for the course. You can take the course in a classroom or online. Attendance is mandatory. Schools that do not take attendance are in violation of state guidelines. Several schools have already been investigated for letting classes go home early. That is a violation of state law. 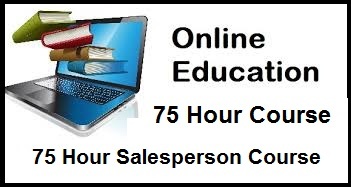 We therefore recommend you take the 75 hour course online. As soon as you are done, you come to the school and take the final exam. Pass and you receive your certificate. If you do not pass, you are given time to take time to study and come back for a retest. Reasonably, you pass and are then permitted to take the state exam. it is $ 15.00 and you register for the exam. Pass the exam, and now comes the fun part. You decide what broker you want to work for. They agree and sponsor you for a license. 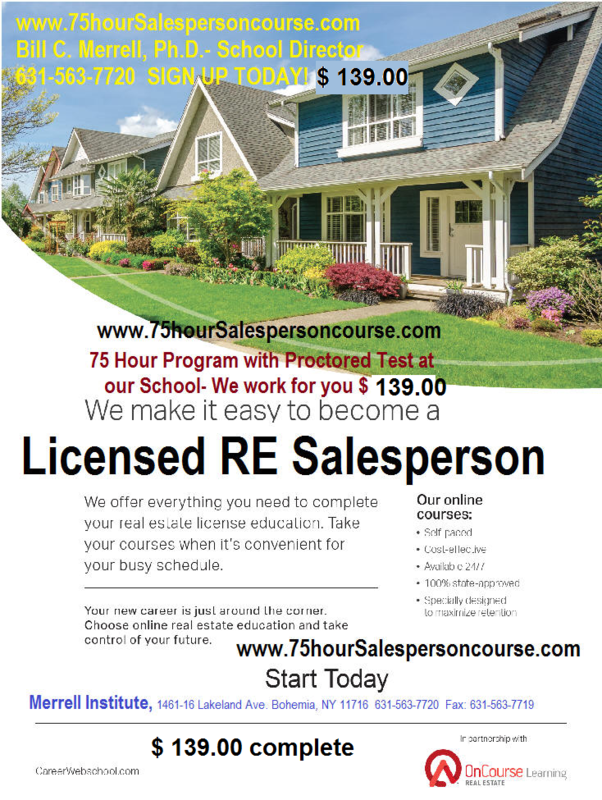 The fee for a sales license is $ 50.00. In 2 weeks your license is received and you can begin working. The fee for the on-line course (which we recommend) is only $ 139.00 and you have 6 months to finish the course. You can finish in weeks as well. You decide. We currently have a course that costs $ 139.00 for all 75 hours of Education including the Final Exam and the certificate upon graduation. Interested? Simply call us up or sign up right now!!! Questions? Call me at 631-563-7720 for details!